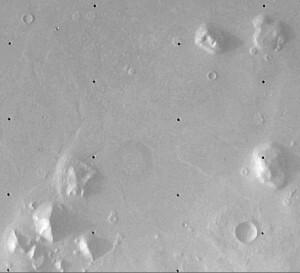 Viking 1 took the first main images of Cydonia – 35A72 and 70A13. Because of these, the Cydonia region has been given further attention and many respected scientists have arrived at new and startling realizations. From the very beginning, certain NASA officials have attempted to cover up and ridicule the photos. They were only accidentally rediscovered years later, and have been the subject of controversy ever since. Due to successful disinformation campaigns, science and the media still treat the Face on Mars as fantasy. In the years since, most Mars missions have mysteriously failed ~ could this also be official disinformation ? Might there have been a few Top Secret “Black Project” manned expeditions to Mars going on all along ? data into black and white pictures – our civilization’s first close up images of another planet. On July 25th, Tobias Owen of JPL was going over the piles of data from Viking 1, looking for possible landing sites for Viking 2, when he came across a glimpse of history. “Oh my god, look at this! That looks like a face!” he said, as he examined the image of a solitary structure reminiscent of the Sphinx, staring serenely out into space (right), from the now historic Frame 35A72 (below) – a moment that was to change the course of Human history. Or was it? In a press conference later that same day, Viking project spokesman Gerry Soffen coined the famous phrase “trick of light and shadow” – and claimed that just a few hours later, the image no longer appeared to be a face – casually dismissing perhaps one of the greatest discoveries of all time. This was, in fact, a lie. There were no pictures taken of Cydonia a few hours later. The probe was programmed to systematically image the planet in sequential orbits, and would have been over an area many miles away at the time in question. Besides, night would have fallen on that side of the planet by then, making any photography from space in that era impossible. Whatever the case, any “later” photograph, proving the mound in no way resembled a human face, was not to be forthcoming – and if any other Cydonian images were ever shot, the matter was not discussed openly. There were to be no further images officially released to the public, until the Mars Global Surveyor mission – on May 5, 1998. It was efficient. It was a textbook cover-up. In the face of indisputable evidence, discredit the source. It seemed perfectly logical at the time to accept the Face as an illusion. But what kind of world might we be living in today, had the pictures of the Face – and the entire Cydonia region, and other similar sites on Mars – been taken as seriously as they deserve? Would we have sent manned missions as soon as humanly possible? Some investigators speculate that this has in fact occurred – but, being the most important discovery in history, they were not about to tell the Russians about it, or anyone else, even to this day. This picture is one of many taken in the northern latitudes of Mars by the Viking 1 orbiter in search of a landing site for Viking 2. The picture shows eroded mesa-like landforms. The huge rock formation in the center, which resembles a human head, is formed by shadows giving the illusions of eyes, nose, and a mouth. The feature is 1.5 kilometers (1 mile) across, with the sun angle at approximately 20 degrees. The speckled appearance of the image is due to bit errors, emphasized by enlargement of the photo. The picture was taken on July 25 from a range of 1,873 kilometers (1,162 miles). Viking 2 will arrive in Mars orbit next Saturday [August 7] with a landing scheduled for early September. In the above caption, replace the purposefully misleading NASA words “shadows” with “fissures” or “indentations” – or “illusion” with “appearance.” Many investigators believe that this press release was censored at the last minute and that the original statement reflected the scientists true feelings of astonishment and cautious celebration, regarding the surprising discovery on the first photos of Mars. regarding these first images from another planet ~ that just happen to reveal not one, but several obviously man made monuments, and suddenly the whole Cydonian issue is taken more seriously. Despite being a prime candidate, the whole issue of Cydonia as a possible landing site was dropped as soon as the pictures became public. This is quite surprising: considering that it was a better location telemetrically, and far more interesting one scientifically, than Utopia – where Viking 2 ultimately landed. According to Carl Sagan, a key player in Viking’s think tank, “there was a significant chance of small quantities of liquid water there.” There can be only one reason for the sudden dismissal: they didn’t want anyone to know about the strange monuments found there. Pyramids on Mars was not what NASA had in mind for international television broadcast that year. Mars, in Crescent This discovery, if made public, would completely rearrange most of what we have been taught and consider to be true. But any proof (like, for example, a photograph) of anything beyond what is considered to be accepted human history, would certainly be controversial in the extreme – and just as easily ridiculed. To quote the movie Contact, ironically written by Carl Sagan, “first rule of government spending: why have only one, when you can have two at twice the price?” Is it really so impossible that Cydonia was not left alone – but instead, actively pursued, and classified at the highest levels? And, dare we ask, what could possibly seem more ridiculous, and be more easily dismissed by serious and officially accepted “respectable” science? How many more missions could there be, then and now, that the public at large knows nothing about? And how many of these supposedly malfunctioned spacecraft, are actually alive and well? versions of these entities who are kept in the dark. 44 degrees north was completely inaccessible to radar site-certification; we had to accept a significant risk of failure with Viking 2 if it was committed to high northern latitudes. . . . To improve the Viking options, additional landing sites, geologically very different from Chryse and Cydonia, were selected in the radar-certified region near 4 degrees south latitude. like structures, known as The City – but by far the center of all attention has been the Human Face staring right back at us from the surface of our nearest neighbor Mars! The many dark gray dots in the image above is “bit errors” or missing-data static, as our interplanetary communication technology was then in its bleak infancy – and still is, although much improvement has comparatively been made. Mars Surveyor 2001 What’s the least amount of technology you would expect NASA capable of today, at the dawning of the 21st Century? Considering that it’s been almost thirty years (as far as we know) since we last went to the moon, more questions tend to arise. When “2001: A Space Odyssey” was first released in 1970, it seemed perfectly plausible to the people of the time that by now there would be orbital space stations, a scientific Lunar community, artificial intelligence, and manned missions to the outer planets. Well, we’ve almost got the video phone thing down. It’s not so much the American people that are being kept in the dark, but our “not always so benign” neighbors. When the space race was won, most scientists expected it was just the beginning. There was no reason, many of them felt, why we wouldn’t have an almost Star Trek space presence by now. It was an exciting time – children wanted to be astronauts when they grew up, and almost everyone acted as if we were at the beginning of a new age – which we were. in the United States regard Goldin’s presence at NASA as ominous. himself a former director of the Central Intelligence Agency. that I’m aware of that was not replaced under the Clinton administration. One perhaps intentional effect of all this staggering disappointment is that the public at large, though perhaps at first intensely curious about the red planet, has had frustration lead to apathy and ultimately has no idea of the controversial reality. Many suspect that this was far too convenient to be true, as it only served to decrease attention and increase the distance between the public and that arm of the space program – and if there really are monuments on Mars, the powers that be have no intention of sharing that information with the general public – at least for now. Why would they? Men In Black It is also especially highly likely that what can be found out on the subject is only the smallest fraction and most easily dismissible aspect of the entire story. Who knows – perhaps, as ufologists suggest, there really is sentient life on Mars, occasionally shooting down whatever probes of ours they can. Or maybe, somewhat more reasonably, it’s just those pesky Secret Settlers: Human beings, born on Earth, working for the darker side of government. Movies like Independence Day and Men In Black were based on more than simple folklore – so maybe it’s both. This was Humanity’s first glimpse of the surface features of Mars ….. or was it ?